Welcome to Villa Montessori Preschool Leesburg! Step into a child’s state of mind… Every day is an opportunity to discover something new. Villa Montessori Preschool Leesburg is a unique preschool designed for the curious and the adventurous; for parents seeking unexpected, intriguing and innovative opportunities for their child. We offer programs for Toddlers (18 months) to 6 years of age. We have over 12 years of experience integrating Montessori and Reggio – two of the most dynamic and inspiring curricula in the world. Our classrooms foster experiences that will stay with your child long into their school careers. Learn more about the difference between a traditional and Montessori preschool experience. Centrally located in Leesburg, Virginia, we welcome families from the surrounding areas in Purcellville, Round Hill, Hamilton, Paeonian Springs, Lansdowne, Lovettsville, Lucketts, Ashburn, Brambleton, South Riding, Waterford, and Sterling. Contact Villa Montessori Preschool Leesburg Today! It’s our job to make your child’s preschool experience a little less ordinary…and a whole lot more memorable! Call 571-281-5800 or use our contact form to schedule a tour or request more information today. 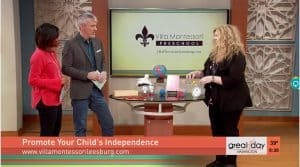 Watch our Executive Director Talk About Montessori and Reggio on Great Day Washington!